#7 in Philly pinstripes is #27 in the Dominican Winter League. 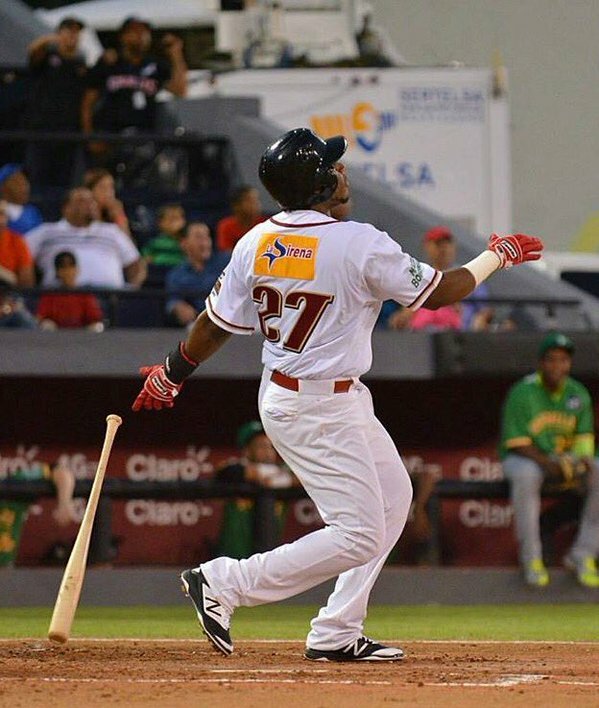 Maikel Franco made his debut with Gigantes del Cibao on Sunday. Batting third as the DH, he went 2-4 including a home run in his second at-bat. Pitching has been identified as the area the Phillies most want to improve. Otero and James Russell, although he is a non-roster player. Late last week right-handed reliever A. J. Achter was claimed on waivers from the Twins and two young, hard-throwing right-handed relievers were added to the 40-man roster, Jimmy Cordero and Edubray Ramos. One outfielder, centerfielder Ramon Quinn, was also a roster addition. Achter has put up impressive minor league numbers. He’ll be in the competition mix in spring training. Read where he’s more of a control-type pitcher as his fast ball is mostly in the 90 mph range. The bullpen is where the game is played these days. It used to be a set-up reliever and a closer but now bullpens are 4-5 arms deep. Just look at the World Champion Royals. Wondering when a World Series ended with the starting pitcher on the mound. Digging through baseball-reference.com I came up with Jack Morris, Game 7, 1991, a 1-0, 10-inning win over the Braves. Morris threw all 10 innings, unheard of today in the postseason. The Phillies roster currently rests at 37 allowing room for more additions. Looking back at last winter’s 40-man roster, only 19 are back. Nine are pitchers, including Jesse Biddle who is recovering from Tommy John surgery. Ron Roenicke (1986-87) is the new third base coach for the Angels and Rick Schu (1984-87; 1001) returns as the hitting coach for the Nationals. The White Sox named Aaron Rowand minor-league outfield and base running instructor. 1B Frank McCormick, who played two seasons with the Phillies (1946-47), is among six former players, three executives and one of baseball’s earliest organizers on the Pre-Integration Era Hall of Fame ballot. Pat Gillick is one of the 16-member Hall of Fame Board-appointed electorate charged to review the candidates. Voting will take place December 7 at baseball’s winter meetings in Nashville. The right-handed hitting McCormick had double figures in home runs seven times. Three of those times, he had more home runs than strikeouts, a real rarity. In 6,206 plate appearances, he had just 189 strikeouts. Defensively, the nine-time All-Star had a 138-consecutive game errorless streak that began in 1945 when he was with the Reds. He holds the Phillies record for highest fielding percentage at his position, .999, making just one error in 134 games in 1946. Thanksgiving dinners take eighteen hours to prepare. They are consumed in twelve minutes. Half-times of football games take twelve minutes. This is not a coincidence. So, gobble till you wobble! 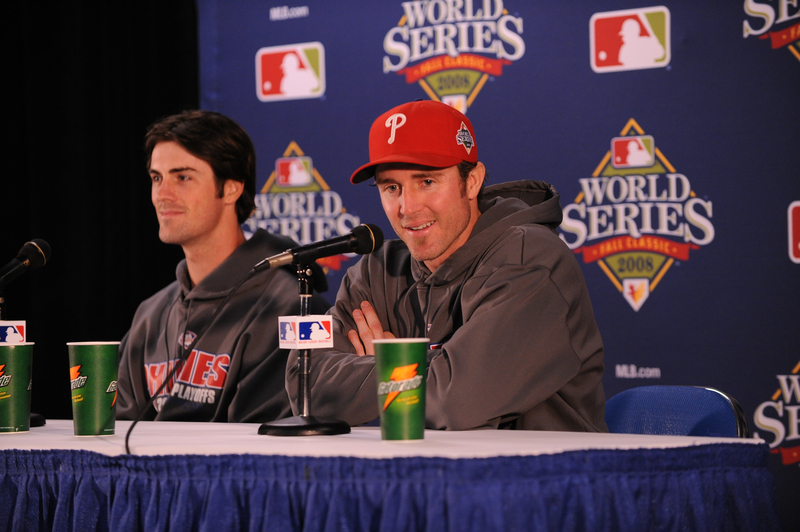 We all know the impact Cole Hamels and Chase Utley had on Phillies history. Paul Hagen captured that and more in a terrific article posted on http://www.phillies.com/alumni. It is must reading. The Baseball Writers Association of America members are having their major awards announced at this time of the baseball calendar. The Cubs, understandingly so, are dominating the awards. That’s what happens when you win. They have the rookie of the year, manager of the year and Cy Young winner. Joe Maddon is an outstanding manager. He’s won the award three times now, the first two in Tampa. He’s won one pennant and lost that World Series. Five division titles, two pennants and one World Series ring. During that five-year run, zero manager of the year awards. Say hello to Charlie Manual. I’ll never understand the thinking of the voters back then. MVP award to match the NL record shared by Stan Musial and Roy Campanella . . .
November 20, 2007: Shortstop Jimmy Rollins succeeds teammate Ryan Howard . . . The Arizona Fall League ends play today with three day games. Leagues in the Dominican Republic, Venezuela, Mexico, Australia and Puerto Rico continue. Look for Maikel Franco, Freddy Galvis, Odubel Herrera, Jorge Alfaro and possibly Cesar Hernandez to begin playing soon. Strength up–the-middle catcher, shortstop-second base and center field–is key on championship teams. Over a six-week period, we’re examining the players at these positions on Phillies pennant winners. So far, the 1915, 1950 and 1980 teams have been reviewed. This week, the 1983 Wheeze Kids, a team that included seven left-overs from the ’80 World Champions, a mixture of veterans and two managers. Winning a club-record 22 games in September, they reached the playoffs and lost the World Series to Baltimore. C Bo Diaz, SS Ivan DeJesus, 2B Joe Morgan, CF Garry Maddox. Diaz, 30, caught 134 games in his second season with the Phillies. A solid catcher, he was second in the league in assists, putouts, base-runners caught but had the most errors (14). His range factor (7.46) was the NL’s best. He was third on the club in homers (15) and second in RBI (64) while hitting .236. Was behind the plate when Steve Carlton won his 300th game. DeJesus, also 30, led the club in triples (7) while batting .254 in his second of three seasons with the Phillies. His .966 fielding percentage in 158 games was fourth-best in the NL. 39-year-old Morgan played just this one season with the Phillies at the tail end of a Hall of Fame career. Play 117 games at second base with a 5.51 range factor, fourth-best in the NL. Carried the team during the last 24 games of the season, seven doubles, five home runs, 18 RBI and a .337 average. For the season, .230 with 16 home runs. Next: the 1993 Phillies “misfits”, December 3. Matt Klentak’s been the Phillies’ GM for three weeks now. When discussing how to continue the rebuilding process, he’s mentioned several ways, summer draft, Rule 5 draft, trades, free agents, waiver wire and international market. **Claimed reliever Dan Otero on waivers. **Signed free agent left-handed reliever, James Russell, to a minor league contract. **Acquired veteran right-handed starter Jeremy Hellickson from Arizona for a 20-year right-hander who’s had two rookie ball seasons as a pro. All three new arms have had success in the majors but are coming off down seasons this year. Russell is typical of relievers, off and on seasons. In 2013, he dominated left-handed hitters, holding them to a .183 average. In 2014, it flipped as right-handers hit only .165. In 2015, .338 (RHH) and .273 (LHH). He did strike out 11 of the 66 left-handed bats he faced. Basically, a reliever brought in to face limited hitters, Russell’s career high strikeouts for an outing is four. He did it twice. Once against your Phillies. He and Otero, a right-hander, will be in the mix for bullpen spots next season. Right now, there are only two left-handed relievers on the roster, Elvis Araujo and Mario Hollands, who is coming back from Tommy John surgery. Hellickson, 28, brings experience to a young staff. He’s in his free agent season after going 9-12 for 27 starts this year. He suffered six losses when allowing three or fewer runs, tied for fifth most in the league. 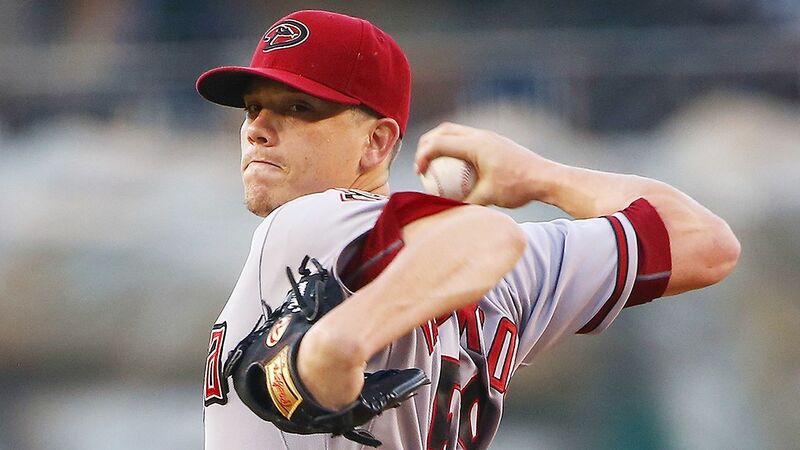 He lost his last four starts, giving up nine runs while the D-Backs scored a total of six. He was sidelined by a strained left hamstring, August 20-September 11. The right-hander had a big game against the Phillies in which he collected two RBI hits in the same inning. He’s also the one who broke Maikel Franco’s wrist with a pitch in that game. One welcome note on Hellickson, he led the Arizona starters with a 62.9 first-pitch strike percentage. First-pitch strikes were too infrequent last season among Phillies arms. Schedule of games in the Arizona Fall League ends on Thursday. Where is Paul Byrd? What is he doing? Check out Paul Hagen’s piece on Byrd at http://www.phillies.com/alumni. ICYMI….The Fightin’ Phillies: 100 Years of Philadelphia Baseball from the Whiz Kids to the Misfits is the title of my new book which will be available starting April 1, 2016, in book stores and on-line. Larry Andersen wrote a hilarious foreword. Publisher again is Triumph Books (triumphbooks.com). Call it what you want–hodge-podge, assortment, collection, mixture–one chapter deals with faces of all sorts. From Phillies major award winners to brothers, broadcasters, those with a cup of coffee and my 50th anniversary team. The latter covers the time between 1883 and 1933, perhaps some unknown faces who have a place in the team’s history. Who are the top five in games caught for the Phillies? Answer can be found at http://www.phillies.com/alumni. Jim Thome, who is immortalized with a statue outside of Cleveland’s Progressive Field, now has had a highway named after him in his hometown of Peoria, IL. Highway HJR0090 is now named Jim Thome Way. Major league coaches now include Mickey Morandini (Phillies first base), Ruben Amaro Jr. (Red Sox first base), Rich Dubee (Tigers pitching), Davey Lopes (Nationals first base) and Mike Maddux (Nationals pitching). Two Phillies Alumni, pitchers Curt Schilling and Bill Wagner, are on the Hall of Fame ballot for 2016. It is Wagner’s first time on the ballot. Schilling who garnered 39.2 percent of the votes a year ago, is in his fourth year on the ballot. Ballots are being mailed this week to approximately 475 voting members of the BBWAA. Writers must return ballots by December 21. Winners will be announced on Tuesday evening, January 6, on the MLB Network. Induction is the July 24 weekend in Cooperstown, NY. Candidates must be named on 75 percent of ballots cast by BBWAA members with 10 or more consecutive years of Major League Baseball coverage to gain election. Catcher Mike Piazza polled 69.9 percent of the electorate in 2015 and fell 28 votes shy of the required amount for election. Piazza is a native of Norristown, PA. Should Piazza being elected to the Hall, a color, oil portrait of him would be added to the Native Sons section of the Cooperstown Gallery in the Hall of Fame Club. Nineteen players who were in the Phillies minor league system this year have opted for free agency. Among the group are OF Kelly Dugan and RHPs Jonathan Pettibone and Ethan Martin. Congrats to Lehigh Valley IronPigs’ Vice President of Marketing & Entertainment, Lindsey Knupp on being the recipient of the 39th Rawlings Sporting Goods’ Woman Executive of the Year. Lindsey will receive her award at the Winter Meetings in Nashville next month. Amanda Koch, the Clearwater Threshers Promotions and Community Relations Manager, is the FSL Emo Murphy Female Executive of the Year award winner. She, too, will be honored in Nashville. The Threshers, headed by GM John Timberlake, has also won the Florida State League John H. Johnson Award for overall operations. The Threshers are now among the franchises considered for the national John H. Johnson Award, minor league baseball’s top award. It is given annually to honor the complete baseball franchise — based on franchise stability, contributions to league stability, contributions to baseball in the community, and promotion of the baseball industry. C Bob Boone, SS Larry Bowa, 2B Manny Trillo, CF Garry Maddox. The 34-year-old Boone was a biology major at Stanford University where he played third base. He switched to a catcher in 1971 and after only 169 games behind the plate in the minors, made his major league debut in September 1972. He was the Phillies everyday catcher for nine years starting in 1973. An excellent defensive catcher and student of the game, he handled pitching staffs that reached the postseason five times, four with the Phillies and one with the Angels. He made three All-Star teams with the Phillies and his .991 fielding percentage led the NL in 1978. Bowa, 34, couldn’t make his high school team and wasn’t among the 824 players drafted in 1965 but signed by the Phillies because he could field, throw and run. He was ready to quit after his first pro game in Spartanburg, striking out all four times against flame-throwing Nolan Ryan. Because of a feisty makeup, he developed into a premier shortstop and collected over 2,100 hits. Larry was the NL’s all-time leader in games played at shortstop when he retired. As a defender, he had soft hands, a strong and accurate arm, plus-range and was consistent on defense. Five times he led the NL shortstops in fielding percentage. At 29, Trillo was the youngest of the group. Originally signed by the Phillies as a catcher out of Venezuela in 1968. Excellent range with a powerful arm that excelled on relays. Led league in putouts in 1980 (360). Also led in range factor three times and among leaders in double plays turned. In 1982, he set a since-broken major league record for consecutive errorless chances at second base (479). Won three Gold Gloves with the Phillies, the 1980 Silver Slugger and selected to three All-Star teams. 1980 NLCS MVP. Maddox, 30, was originally a second-round selection by the Giants in the 1968 draft. The Phillies acquired him on May 4, 1975, for Willie Montanez, a trade that wasn’t very popular. He quickly became a fan favorite in Philly with his outstanding defensive play in centerfield, playing on six teams that reached the postseason. He was nicknamed the “Secretary of Defense”. With long, loping strides, he could track down any ball in left or center. He was able to play shallow and went back on the ball well. Garry won more Rawlings Gold Gloves than any other Phillies outfielder, eight. Add 3B Mike Schmidt to the mix and Phillies had the finest defensive team in baseball and franchise history. Schmidt won 10 Gold Gloves in his career, Boone and Trillo, three each and Bowa two. From 1976 through 1982, the Phillies had 21 award winners, including four in a season three different times. Oddly, they only had two winners in 1980, Maddox and Schmidt. Can you name the Phillies legend who attended Michigan State on a basketball scholarship? The answer: Hall of Fame pitcher Robin Roberts, posted by Jim Peyton. Pitchers and catchers report to Bright House Field on February 18 with the rest of the squad five days later….14 weeks and two days from now. 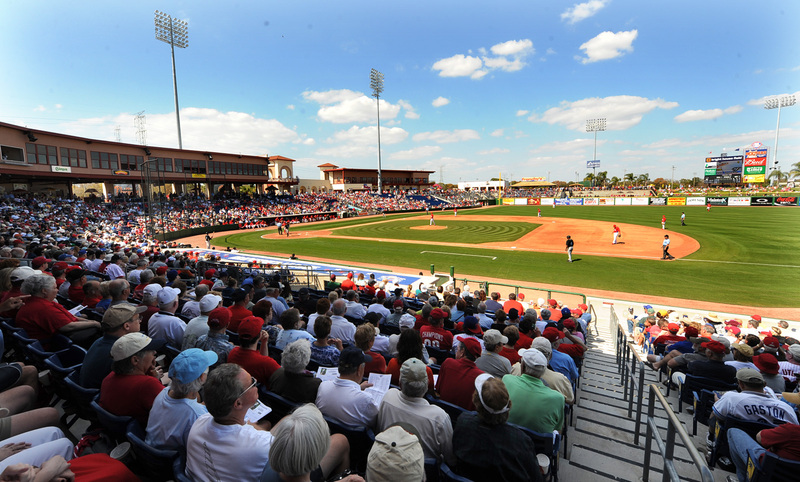 It will mark the Phillies 70th year of holding Spring Training in Clearwater. Pete Mackanin organized the daily spring training workout schedule the previous two years for Ryne Sandberg. As a manager in spring training for the first time, Pete can run the camp as he sees fit. It’ll also be the first camp for Matt Klentak, the new GM, and Andy MacPhail, the new president. The schedule not only includes Grapefruit League games in Florida but three games up north. For the first time there will be a two-game series, Phillies Futures Games. Phillies of tomorrow will play alongside the Phillies of today in intra-squad games. The first will be March 21 at FirstEnergy Stadium in Reading and the second, April 2, at Citizens Bank Park. An On-Deck Series game with the Orioles will also take place at Citizens Bank Park on April 1. Check out the complete spring training schedule at http://www.phillies.com. Baseball America has listed their top 10 prospects for each of the 30 big league clubs. The publication began with the teams in the National League East. RHP Ranfi Casimiro (Dominican Republic) and 3B Jan Hernandez (Puerto Rico) are now participating in their native winter leagues . . . 20-year-old RHP Victor Arano is lights out pitching in his native country (Mexico). In 12 appearances, he is 3-0, 0.66 ERA; opponents are hitting .184. He was one of two prospects acquired from the Dodgers in 2014 for RHP Roberto Hernandez. 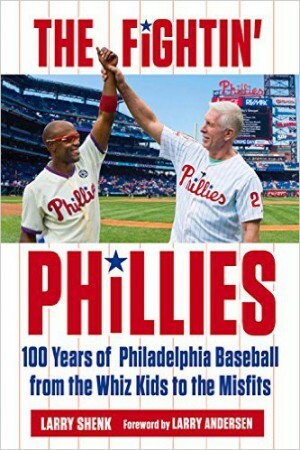 One chapter deals with the history of the Wall of Fame which was started at Veterans Stadium in 1978 and included both the Phillies legends and those of the Philadelphia Athletics. With the opening of Citizens Bank Park, the Wall was located in the Toyota Memory Lane area of Ashburn Alley. In addition to the verbiage of each plaque there’s additional personal information on each Wall of Famer. Can you name the Phillies legend who attended Michigan State on a basketball scholarship? Plenty of going on at the Phillies home during the offseason: Mike Boekholder (Director, Field Operations) and his crew have completed re-soding the infield . . . On Wednesday evening, Phantasy Campers will take batting practice in the Phillies’ and visiting team’s indoor batting cages . . . All day Saturday some 8,000 participants will compete in the Spartan Race . . . That evening the Goldberg Bar Mitzvah (Diamond Club) and Sunday afternoon, the Sands Bar Mitzvah (Phillies clubhouse). 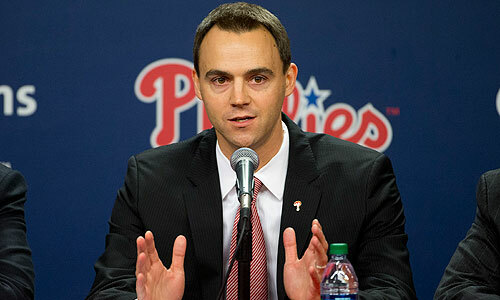 During his introductory press conference, new GM Matt Klentak said he hadn’t even seen his office. Well, he’s there now. The GM office is on the east end of the executive offices which are located on the Hall of Fame Club level. The president’s office (Andy MacPhail) is on the opposite end. 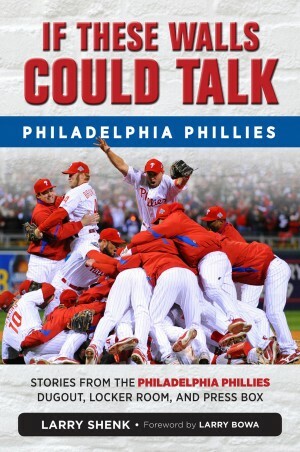 Matt is meeting with the Phillies beat writers at noon today and will appear live on the Philly Sports Talk hosted by Michael Barkan on ComcastSportsNet. The show begins at 5 p.m. He’ll also scheduled for the MLB Network and XM Radio the next couple of days. Matt, Andy, assistant GM Scott Proefrock and Greg Casterioto (Director, Baseball Communication) will be attending the GM meetings. Greg is going as writers from the Inquirer, Daily News, Wilmington News-Journal, CSNPhilly.com and MLB.com will be covering the meetings. So, get ready for some baseball coverage, the start of the Hot Stove League. Mother Nature has four seasons, spring, summer, fall and winter. If she wants to skip winter, that’s fine. Baseball also has four seasons, spring training, the regular season, postseason and now hunting season. Hunting season? Yep, time for teams to go hunting for free agents. It’s hunting season at this time of the year in Pennsylvania for deer, black bear and wild turkeys. Those hunters are armed with weapons. Baseball hunters are armed with check books. Will some free agent signings turn into wild turkeys? Free agents are eligible to sign with any team starting on Saturday. Agents usually prefer show and tell over quick signings. **Monday through Wednesday, GM meetings in Boca Raton, FL. **December 2, deadline for teams to decide whether or not to tender contracts to their arbitration-eligible players. The free agent market could expand on this date. **December 7-10, winter meetings in Nashville. Included during that time period is the annual Rule 5 Draft. Phillies have the first selection. Right-handed reliever Dan Otero was claimed off waivers from Oakland on Tuesday, the first official transaction by GM Matt Klentak, who saw the reliever often the last three seasons. The Phillies poor 2015 season gives them the first chance at the waiver wire up until the start of next season. Otero, 30, is a Florida native who played college ball at Duke and the University of South Florida. The Giants drafted him in the 21st round in the 2007 draft. Five years later he made the Giants’ opening day roster. 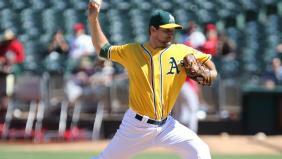 He was claimed off waivers by the Yankees on March 26, 2013 and by the A’s three days later. Otero had a very good season in 2014 and couldn’t match it this year. That’s nothing new for relievers, off and on seasons. Unfortunately, it happened to Justin De Fratus this year. The Arizona Fall League has announced the East and West Division rosters for the 10th annual Fall Stars Game, which will take place this Saturday at 8:08 p.m. ET and will be broadcast on MLB Network and MLB.com. Phillies have two players on the West squad, reliever Edubray Ramos and catcher Andrew Knapp. Strength up-the-middle is key on championship teams–catcher, shortstop-second base and center field. Over a six-week period, we’ll examine the players at these positions on the Phillies pennant winners. Leading off last week were the 1915 Phillies. This week, the 1950 Whiz Kids. 1950: C Andy Seminick, SS Granny Hamner, 2B Mike Goliat and CF Richie Ashburn. At 29 years of age, Seminick was considered the “grandpa” of this young team that won the pennant on the last day of the season in Brooklyn. He was a no-nonsense player, tough as nails and an excellent handler of the pitching staff. Caught 124 of 157 games (there were three ties). He sustained a broken ankle on the final Wednesday of the season, caught a doubleheader the next day and played on it throughout the World Series. Hamner, 23, while only in his second full season as the shortstop, was the captain and the anchor of the infield. He was a brilliant fielder even though he made 48 errors. He also was involved in 100 double plays while playing in every game (157). He had a gun for an arm. Offensively, he was a tough clutch hitter. In his career with the Phillies he was twice an All-Star at shortstop and once at second base. Goliat, 28, wore a Phillies uniform for three seasons but was a regular only once, 145 games in 1950. He was a good fielder with a strong arm. His .234 average that season was a career high as were his 13 homers. Ashburn, 23, played in an era of three other Hall of Fame centerfielders, Willie Mays, Duke Snider and Mickey Mantle. While he didn’t have their power, he was the game’s best leadoff hitter and defender in centerfield, the anchor of the Whiz Kids defense. He shares the major league record for most seasons leading the league in putouts, nine. His .988 fielding percentage was the best among 1950 NL centerfielders. Not gifted with Mays’ arm, Ashburn annually was among the league leaders in assists. His biggest came in the last game of the season when he gunned down Cal Abrams with the winning run in the ninth inning. The Phillies won the pennant the next inning. Next week: the 1980 World Champions. Tuesday’s 3 p.m. NFL trading deadline passed quietly. The only news was that there was no news. He’s back. Fan favorite Mickey Morandini returns to the major leagues as Pete Mackanin’s first base coach and base-running instructor. A member of the Phillies player development staff for the past five seasons (2011-15), Morandini managed single-A Williamsport (2011) and single-A Lakewood (2012-13) before serving as a coach for both triple-A Lehigh Valley (2014-15) and double-A Reading (2015). Mickey has worked with young Phillies, Maikel Franco, Cesar Hernandez and Aaron Altherr and top prospects such as J. P. Crawford, Nick Williams, Andrew Knapp and Roman Quinn. RHR Hector Neris, RHR Nefi Ogando and LHP Joely Rodriquez are now pitching in the Dominican Winter League . . . The Puerto Rican Winter League has begun play and 1B Brock Stassi, INFs Jesmuel Valentin and Emmanuel Marrero and LHP Hoby Miler are playing there. SS J. P. Crawford’s Arizona Fall League season ended last week at five games because of a partial tear of the UCL ligament in his left thumb. He’s expected to be 100 percent healthy by spring training. INF Drew Stankiewicz (Clearwater-Lakewood) replaced Crawford on the Glendale Desert Dogs. When a team wins the World Series, other clubs often try to follow that model. Well, the Royals have solid starting pitchers, a deadly and deep bullpen, excellent defense, a relentless offense that puts the ball in play, aggressive base-running and little power. Yes, in 16 postseason games, they hit 17 homers. (In the regular season, 139 in 162 games to rank #24). Other postseason numbers: their hitters fanned 108 times; their pitchers struck out 160. They scored 90 runs, 51 after the sixth inning, including all seven in Sunday’s deciding game. Errors? 3. From Elias Sports Bureau: Kansas City was the first team to win three games in the same World Series in which it trailed in the eighth inning or later. 2005, Pat Gillick hired as GM. A roster of 23 players and a rookie manager etched their place in Phillies history by winning the franchise’s first National League pennant in 1915. While we have lived through later championship clubs, we know little about the team from 100 years ago. Their faces are obscure but they have a special place in the team’s history. Included in this chapter is a fascinating story by Bob Warrington, a baseball historian and author, about spring training in St. Petersburg, FL.